The team at Atomos really know how to do it right. AtomHDR is a breakthrough product that became available a few months ago. And now all Atomos has released this as a three upgrade to SHOGUN and NINJA ASSASIN owners. Now that’s a class act. This new firmware update for their Shogun and Ninja Assassin 4K recorders that brings expanded dynamic range viewing when shooting in Log. It does this by using the same AtomHDR processing as the newer Flame series, but with in the limits of the Shogun and Ninja Assassin’s lower screen brightness. Also released is a public beta of the new CinemaDNG (CDNG) recording feature. This works with Sony’s range of FS cameras, the FS700 with the 4K Firmware update. FS5 with the paid CBKZ-FS5RIF update option and the FS7 with the XDCA-FS7 extension unit. Recording to CDNG allows you to capture at 12bit 444 giving increased flexibility in post production – ideal for image sequences that will be treated to higher end finishing and grading. The downside of CDNG is that the file sizes are much larger than ProRes or DNxHD making it impractical for longer shoots unless you have a lot of storage space. In the new firmware you have the ability to view a Log image in a multitude of ways. You can now toggle between the Log image direct from the camera viewed in standard REC.709 (i.e. washed out), Log to Rec 709 Video with in-built LUT applied, with a custom LUT of you choice applied to the image, or viewed using the AtomHDR processing engine to develop the Log image. When using AtomHDR the extended dynamic range of the image provides a natural linear looking image that Atomos claim is closer to how the human eye would experiences the scene. All these options are available with a simple touch of the screen. To avoid confusion its worth pointing out that while the new extended dynamic range viewing on the Shogun and Ninja Assassin use similar principles to HDR on the newer Flame models, the dynamic range is lower because the screens on the older recorders aren’t as bright. A common way of exposing Log footage (for standard REC.709 delivery) has been to ‘expose to the right’. In other words to deliberately add an extra stop or two of exposure with the aim of opening up the blacks at the same time as reducing noisy shadow areas. This relies on the ‘extra’ information stored in the highlight part of the Log curve being retrievable in post. Even with the extra dynamic range of Log the highlights can still be accidentally blown out (especially when working in fast moving factual shooting situations) and this is where being able to quickly preview what that part of the image looks like should help matters. What you get is an image on screen that has approximately two more stops of dynamic range than without the processing (note that the dynamic range of the Log image recorded remains the same). This enhanced viewing should allow the user to get a better visual representation of what details are retained in the highlights or shadows of an image – something that has been heavily reliant on the likes of histograms, waveform monitors and educated guesswork up until now. Alongside the ability to view increased dynamic range Atomos has also provided updates to the waveform display. You can now view the clipping point of Rec.709 on your exposure. To get an even better viewing experience Atomos recommend using their existing sunhood which provides an improved viewing experience as it cuts out a lot of the ambient light, so improving how your eyes resolve the dynamic range on the screen. The update adds a few other nice tweaks such as the ability to play back clips at a reduced frame rate in both forward and reverse, providing an ideal way to use you 1080p60 footage at half speed and preview this on the fly without needing to wait until your back at your edit system. An update for users of the older Ninja & Samurai Blade recorders is also due in the upcoming days and this will again add the AtomHDR monitoring feature and a few tweaks under the hood. 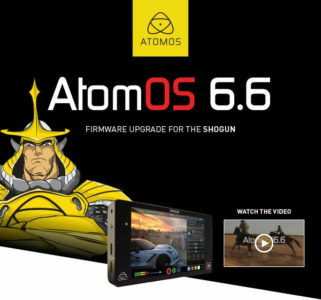 The new firmware doesn’t give the older Shogun and Ninja Assassin all the bells and whistles of the newer models (especially for a HDR workflow), but Atomos’ continued commitment to upgrades for existing users is impressive. If you have updated your Atomos recorder do let us know how you get on with it. You can download the updated firmware from the Atomos website now. – HDR monitoring is supported on log cameras from Sony, Canon, Arri, Panasonic, JVC and RED. – Improvements have been made to colour gamut accuracy. – Improvements to accuracy and resolution in blacks when using AtomHDR mode. – A visual improvement has been made to the AtomHDR slider for easier access. – While in AtomHDR mode, a simplified HDR waveform line has been added to easily set the correct slider position for the dynamic range of the scene. – AtomHDR includes options for WFM Auto which automatically sets the HDR level for the current sceneâ€™s max brightness and WFM HDR which scales the WFM to view the HDR range to the full height of the WFM. – The waveform monitor will now display a percentage scale based on the input log mode. – Slow motion is now available in playback mode. Pausing video playback will automatically display the slider above playback controls and give you access to forward and reverse speed adjustments.